Seismic research vessels hired by Exxon Mobil to explore for oil off Guyana's coast have not returned to the site of a December incident with Venezuela's navy, but they may in the future, Guyana's foreign minister said on Thursday. Guyana, with no history of oil production, has become the focus of intense interest since Exxon announced the discovery of over 5 billion barrels of oil and gas off its shores. That has reignited a century-old territorial dispute with neighboring Venezuela. OPEC-member Venezuela's crude output is near its lowest levels in 70 years amid an economic crisis. In a speech at a trade union forum in the capital Georgetown, Foreign Minister Carl Greenidge said the Dec. 22 incident when the ships complied with Venezuela's order to turn around - which both countries say took place within their territorial waters - would not necessarily hold back future exploration. "They haven't returned to the area. It doesn't mean they can't return in the future," Greenidge said. "We're not speaking in absolutes here." 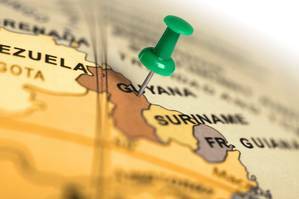 Other oil companies, including Spain's Repsol SA, are active in offshore Guyana. Greenidge said Chevron Corp had applied for a government license, without providing further detail. Chevron does not comment on specific business opportunities, a spokeswoman said. According to a notice posted on Guyana's Maritime Administration Department's website before the incident, the ships' activities were expected to begin on Dec. 6, 2018, and conclude on Dec. 31. No new notice has been posted. Venezuela's Information Ministry did not immediately respond to a request for comment on Greenidge's statements. In a press conference on Wednesday, socialist President Nicolas Maduro praised the armed forces for intercepting the ships, noting that if it were not for their patrol, "one day we would get there and they would be taking oil." "Is a world like that viable, without respect for international law?" Maduro said. Griffon Hoverwork will launch its new 995ED model at Exponaval in Valparaiso, Chile.